Earlier this month, we talked about the importance of getting a full night’s rest and natural ways to improve your quality of shut-eye. Today, we’re sharing a few easy recipes that can help make counting sheep easier. From an essential oil pillow spray to a drinkable herbal tonic, here are a few DIY sleep aids to lull you off to the Land of Nod – sans medication. If thinking about the next day’s to-do list is keeping you up at night, aromatherapy – breathing in the scent of certain essential oils – can be a great tool to ease anxiety and induce rest. Since your pillow is the closest thing to you during sleep, it’s best to put the therapeutic oils where you’ll smell them the strongest – directly on your pillowcase – with this all-natural, non-toxic pillow mist. Note: My favorite oil combination for bedtime? Lavender, chamomile and vetiver. Add all ingredients to the glass bottle – dark glass is a must as it’ll block sunlight and preserve the purity, quality and soothing scent of the oils. Replace spray nozzle top and screw on tightly. Shake well to combine. Spray directly on your pillow and liberally in the air of your bedroom just before hitting the hay. Breathe deeply to experience the full therapeutic effects of the oils. Epsom salts contain the mineral magnesium, which is a naturally occurring muscle relaxant able to soothe achy limbs. If restless legs or sore muscles keep you up at night, consider taking an Epsom salt bath before turning in. Adding lavender oil and dry lavender buds make the experience even more calming. Combine all ingredients in a mixing bowl. Stir well. Transfer to a glass jar and store in a dark, cool place. About an hour before bed, add ½ cup of the salt to a warm bathtub. Soak in the water at least 15 minutes to experience its maximum soothing effects. Note: If you have broken or sensitive skin, an Epsom salt bath may not be right for you. If you have a health condition such as kidney disease, consult your doctor before soaking in Epsom salt. 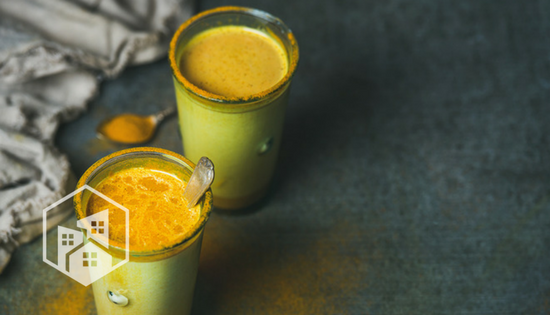 Doctors and nutritionists alike have raved about the healing benefits of “golden milk” – also known as turmeric tea. Full of unconventional, albeit delicious ingredients, turmeric tea can aid digestion, boost the immune system and combat inflammation. Plus, the warmth of the drink is perfect for relaxing the body before sleep. Best of all, golden milk is easy to prepare! Try it tonight before bed. Pour milk into a saucepan and place on the stove over medium-low heat. Add cinnamon, turmeric powder and ginger. Whisk until spices are fully dissolved. Stir in coconut oil and honey until melted. Simmer until warm, and pour into a mug. Sip up to an hour before bedtime.